Practice numbers to 20, number sense, and counting skills this winter with differentiated ten frame task cards & pages that can be used as a small group activity, center activity, an around the room (write the room, SCOOT) activity, and more. Includes 2 sets of color-coded task cards (one set with self-checking QR codes, one without) and 1 set of differentiated printable pages. This is a sample set from my Winter Numbers with Ten Frames Differentiated QR Code Task Cards which includes 3 sets of task cards and differentiated pages. Students count the marshmallows in the ten frames in each cup of hot chocolate and record their answers on printable pages. 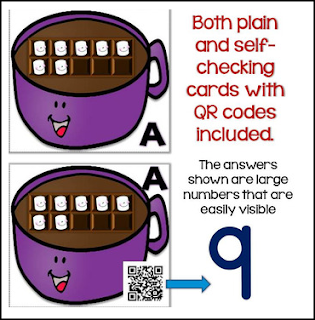 If you are using the cards with QR codes, students can scan the code to see the number (in large print that is clearly visible to young students) and receive immediate feedback. K.CC.A.2 - Count forward beginning from a given number within the known sequence (instead of having to begin at 1). K.CC.A.3 - Write numbers from 0 to 20. Represent a number of objects with a written numeral 0-20 (with 0 representing a count of no objects). K.CC.B.4 - Understand the relationship between numbers and quantities; connect counting to cardinality. K.CC.B.4.A - When counting objects, say the number names in the standard order, pairing each object with one and only one number name and each number name with one and only one object. K.CC.B.4.B - Understand that the last number name said tells the number of objects counted. The number of objects is the same regardless of their arrangement or the order in which they were counted. K.CC.B.4.C - Understand that each successive number name refers to a quantity that is one larger. K.CC.B.5 - Count to answer "how many?" questions about as many as 20 things arranged in a line, a rectangular array, or a circle, or as many as 10 things in a scattered configuration; given a number from 1-20, count out that many objects. TpT gives credits for every $ you spend ONLY after you provide feedback. You may use your credit points for future purchase of any TPT products! If you decide to purchase, please don't forget to leave feedback, a fair rating and a fair comment Click HERE for more information about TPT credits.